Are you still re-ordering your factor pattern by sorting columns in Excel? Well, do I have a tip or two for you. The cool thing about some large conferences is that even the things you hadn’t planned on attending can be worth while. For example, during one time slot, I didn’t have anything particular scheduled and Diane Suhr was doing a talk on factor analysis and cluster analysis. Now, I published my first paper on factor analysis in 1990, so I was mostly interested in the cluster analysis part. After all of those years, how did I not know that PROC FACTOR had an option to flag factor loadings over a certain value? Somehow, I missed that, can you believe it? I also missed the REORDER option that reorders the variables in the output from largest to smallest on their loading on the first factor, then in order of their loading on the second factor and so on. It’s super-simple. Use FLAG = value to flag loadings and REORDER to reorder them, like so. You can see the results below. With a small number of variables like this example, it doesn’t make much difference but in an analyses with 40 or 50 variables this can make it much easier to identify patterns in your data. I am backwards woman. I write about statistics and statistical software in my spare time and my day job is making video games. In my defense, the latest series of those games teaches statistics – in Spanish and English. 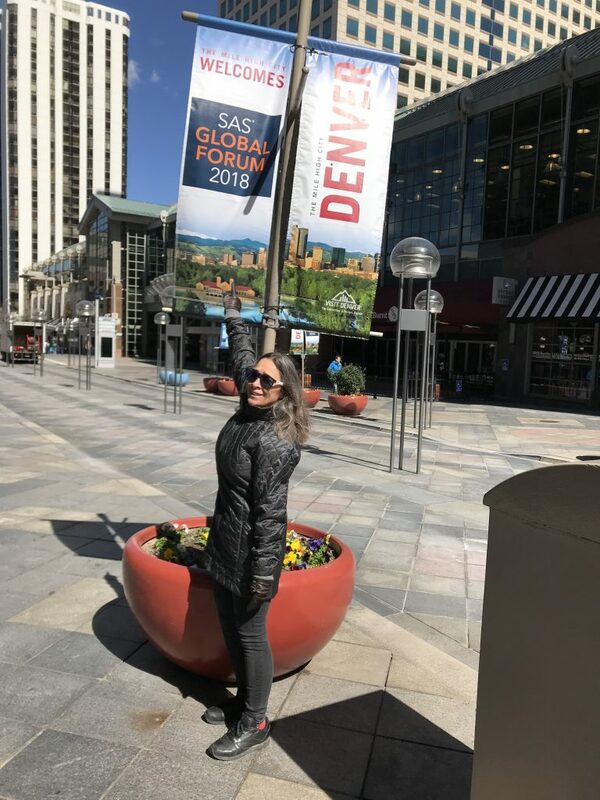 The first time I went to SAS Global Forum, over 30 years ago, it was actually called SUGI (SAS Users Group International) and it was in Reno, NV. I was a just-divorced single mom and there was no such thing as a Working Mothers Room (which I noticed signs for here in Denver). I paid for a bonded sitter, on contract with the hotel, to come to my room and watch my toddler. That toddler is now CEO of 7 Generation Games. So, yeah, it’s been a minute. 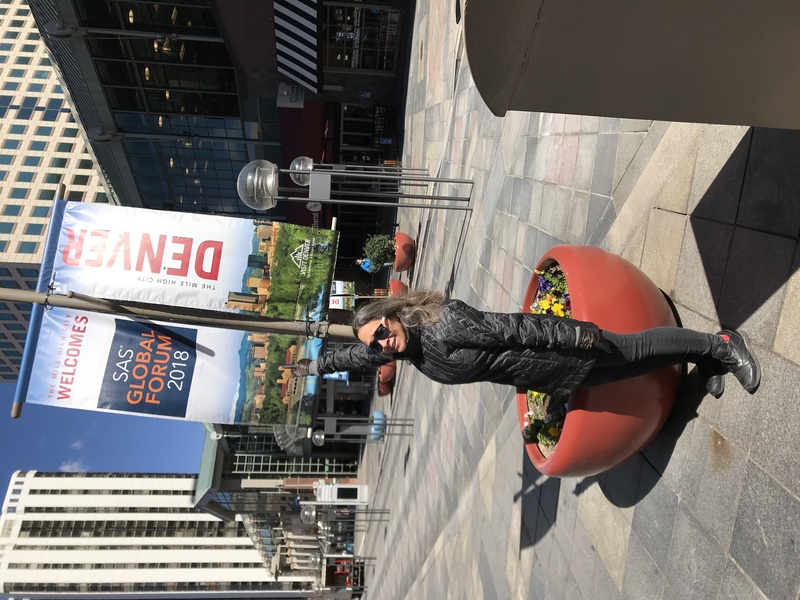 Having been to these events over 30 years, not to mention a dozen or so at WUSS (Western Users of SAS Software) I thought I might need to put some effort into learning new stuff. My plan was to pick one product that I wanted to learn more about and make my own little personal strand on that. 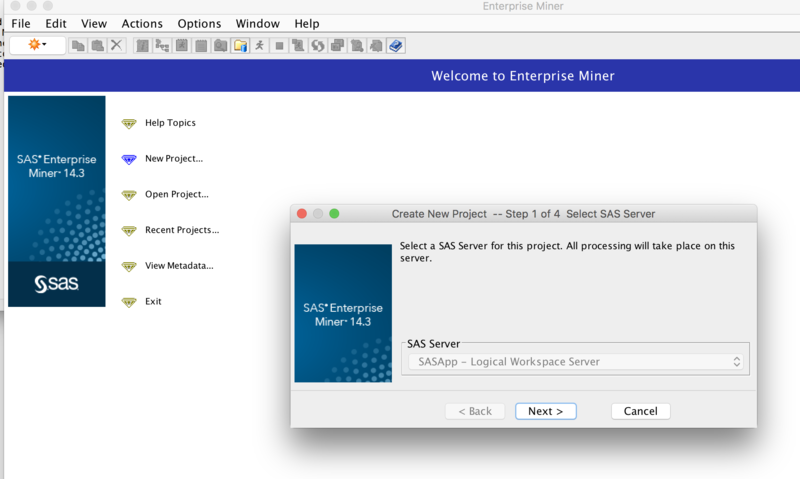 I picked SAS Enterprise Miner. I hadn’t used it a lot, and not at all lately, and I thought it might be a good choice to introduce students to a more data mining – a topic I just touch on in my multivariate statistics course. The first session was 10 Tips Learned in 20 Years of Enterprise Miner, by Melodie Rush. Did you realize that the nodes in EM are in alphabetical order? No, me neither. I also didn’t know that the Reporter node could automatically generate documentation. If you are registered for the conference, you can download the presentation from the app, even if you didn’t attend. There wasn’t another Enterprise Miner presentation in the morning, so I wandered over to The Quad and talked to Tom Grant in SAS Global Academic who told me that now you can download a file tiny little 26kb file and run SAS Enterprise Miner on the SAS server, whether you use Windows or Mac. I remembered something like this years ago but it was deathly slow and it sucked. Your other option was to install SAS EM on your desktop which did not exactly require sacrificing a goat, taking your computer apart and putting it back together with each piece bathed in goat’s blood – but it wasn’t all that much easier. Well, times have changed ! I already had a SAS On-demand for Academics account, I clicked to get Enterprise Miner. A file called main.jnlp downloaded and when I double-clicked my Mac said it was from an unidentified developer – so I went into the preferences and selected to open anyway. Then, I got a message my version of Java was out of date. I clicked to update it and was directed to download and update it. leaving me time to head over to the convention center and see what Scott Leslie and Tricia Aanderude have to say about health outcomes and visual analytics. How fast does the EM in the cloud run, you ask? Well, I am in a hotel where the wi-fi is about the same as my apartment in Santiago – that is, somewhere mid-way between Santa Monica and North Dakota speed. It runs fine. I can see using it as a demo in a class or making instructional videos with it. Screens don’t pop up as fast as if it was a regular web page but so far the minimal delay is not enough to be annoying to students using it for analyses or teachers using it to demonstrate. So far, today’s Enterprise Miner strand plan was a success , however, after that, things definitely did not go according to plan, but still great. I’ll have more on that in my next post.